What do you really want from a security suite? Most companies appear to believe the answer is "as many features as possible", and so they’ll cram their products with as many vaguely security-related tools as possible, in the hope that the sheer weight of functionality might win you over. Comodo Internet Security Pro 2013, however, takes a very different route. There’s no spam filter here. No parental controls, or backup tool. And it won’t add warning icons to your web page search results. Instead, the program concentrates very much on the core security basics: detecting and removing known malware immediately, while preventing even brand new threats from causing any damage. This doesn’t mean the suite is underpowered, though. You still get strong real-time and on-demand scanning, and a firewall to block network attacks, as well as automatic sandboxing and a very configurable host intrusion protection system (HIPS). And if all that sounds a little complex, Comodo Internet Security Pro 2013 will make most security decisions on its own, no need for prompts or alerts. And if you do have problems, the suite actually includes a live chat component where you can talk to a technician, who might then (for instance) connect to your PC and help you remove a virus. Sounds promising. But would the reality live up to the marketing? We decided to find out. Comodo Internet Security Pro 2013 installed quickly and without issues. Disk consumption was average at around 256MB, but RAM use was more than we expected, with the suite requiring multiple support processes (we counted 10, requiring around 75MB RAM on our test PC). The interface seemed familiar, at least initially. A desktop widget displays your basic security status, and provides buttons to launch a few common tasks. A system tray icon does a little more, and you can also launch the core Internet Security Pro 2013 console, where again the most basic tasks (scans, updates and so on) are immediately visible. It’s all very straightforward and beginner-friendly. If you’re a more experienced user, though, the new look and feel may not be so impressive. The opening screen makes poor use of screen real estate, with excessive white space, oversized graphics and more wasting perhaps half of the console area. We’d rather have seen more space devoted to an extra status pane or two. And accessing the more advanced controls (firewall, sandbox, settings and more) can require multiple clicks, maybe 6 or more, as you head off to the program’s Task pane and drill down through various options to try and find what you need. There are some things you can do to alleviate this. If you’d like immediate access to the "Stop Network Activity" button (which immediately kill your internet connection), for instance, then all you have to do is right-click it, and select "Add to Taskbar". The option will then appear on the bottom of the main console, as well as the widget, making it quick and easy to find. Still, on balance the Comodo Internet Security Pro 2013 interface feels like it still needs work. Beginners may be happy with the way it hides functionality, but the more experienced are likely to be left wishing it was just a little more configurable. 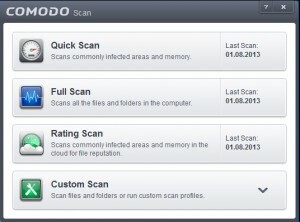 Click "Scan" and Comodo Internet Security Pro 2013 offers four main scanning options. The "Quick Scan" option checks your system’s most commonly infected areas. This took a slightly below par 6:49 to scan 44,463 objects on our test computer. The regular "Full Scan" will scour your entire system. This performed relatively well on our test PC, scanning 869,864 objects in 25:09, although it may not look that way from the progress bar (it was still showing us around 33 percent complete when in fact there were only a couple of minutes to go). Accuracy was acceptable, if not outstanding, with the program detecting and removing 85% of our test samples. As is often the case, we found Comodo Internet Security Pro 2013 also classed a lot of small utilities (some Nirsoft tools, for instance) as malware, but if you’re sure an alert is false then opt to ignore it and you won’t be hassled again. The "Rating Scan" provides a cloud-based check on the reputation of key files on your system. A single table shows you the file’s age, whether it’s an autorun component, and its rating ("Trusted", "Unknown" or "Bad"). Another interface issue means the table isn’t sortable, so for instance you can’t click the "Age" column header to view the most recent files together, but this is still useful when you’re manually hunting for problem files. And a final "Custom Scan" option provides a host of other capabilities. It allows you to scan a specific file and folder, for instance; reconfigure exactly what the "Quick Scan" and "Full Scan" profiles do; add new profiles of your own; or set up scans to run automatically on a daily, weekly or monthly schedule. Locating and setting up these options isn’t quite as easy as it should be, unfortunately. As before, Comodo’s philosophy seems to be "bury the ‘advanced’ stuff in a corner somewhere and hope no-one minds". Still, there’s plenty of configurability here, and with a little work the program will soon be set up to suit your needs. Scanning is fine for protecting you against known threats, but of course brand new malware remains a problem. And so Comodo Internet Security Pro 2013 checks every program you run or install, alerting you to any which are unknown, and automatically running these in an isolated environment to limit the damage they can do. Does this work? It’s hard to offer 100 percent guarantees, but we tried installing a few keyloggers and similar tools, and if they weren’t detected on launch, then they proved unable to log or track what we were doing. The sandbox restrictions may cause issues in some cases, but if you’re sure a program is safe then you can always tell Comodo not to isolate it again after the first run, and the auto sandboxing didn’t produce any significant issues for us. Comodo Internet Security Pro 2013 also provides buttons to run your browsers in the sandbox, when you know you might be visiting unknown untrusted websites. The idea being that even if you visit a site which is infected by something, it won’t be able to break out of the sandbox and reach your own PC. And there’s even a Virtual Kiosk, a complete virtual desktop (complete with an on-screen keyboard to help defeat keyloggers) where -- in theory -- you can install or run programs without them leaving any history behind on your real system. One perhaps significant issue we noticed with the Kiosk is that, during one session, we tried to launch IE10 a couple of times with no apparent results. 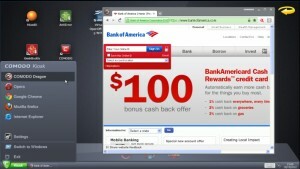 Yet on closing the Virtual Kiosk, we found two new IE10 windows on our regular desktop. Which suggests it’s possible to launch a program in what you think is a safe environment, but have it actually run, and have some level of access to your normal PC. This may not be quite as bad as it seems, because after noticing the problem once, we were unable to reproduce it. And so, while worrying, we can’t rule out the possibility that the issue might have been some rare problem specific to our own setup. There are other complications, though, including the need to manually "reset" the sandbox occasionally (delete files accumulated by virtual applications). The system doesn’t do this itself, you must manually click a "Reset Sandbox" button, and the cleanup process doesn’t always work correctly. On one occasion, we found the Virtual Kiosk would no longer launch, displaying a "User data corrupted, please reset sandbox" message: we duly clicked the Reset button, but got the same error again (and again, and again…), and only rebooting restored normal operations. Comodo Internet Security Pro 2013 also provides a firewall, which does a capable job of blocking network attacks. It’s reasonably configurable, and by default won’t hassle you with annoying alerts. Experienced users will appreciate the highly configurable host intrusion detection system, which monitors all the processes running on your PC and provides a huge amount of control over what they can, and cannot do. If you’re a Windows expert then you’ll love KillSwitch, a powerful extension of Process Hacker with all kinds of tools to help you manually track down malware. And, of course, there are the two main additions which distinguish Comodo Internet Security Pro 2013 from the free edition. The "$500 Virus-Free Guarantee", for instance, promises that if your PC gets infected by malware and can’t be restored to normal working order, they’ll cover pay up to $500 to cover the cost of a repair "by a Comodo certified service". Which sounds good, but this only applies in the US, doesn’t cover losses (you can’t add up the cost of lost profits, files or data, say), and you have to comply with several other conditions. Check the official EULA for more. What’s more interesting is the inclusion of Comodo GeekBuddy, a live 24/7 technical support service. Whether you’ve an issue with Comodo, a virus you want to remove, a software configuration difficulty, a Windows problem or whatever, you can ask for help. A built-in chat client allows you to describe your problem, and the technician at the other end is then able to remotely connect to your system (with your permission) and try to fix things. This proved more responsive than you might think. In our tests, we managed to reach someone quickly, within around a minute. The technicians were polite and generally did their best to help, although not necessarily for long; when we reported our Virtual Kiosk "User data corrupted" error, for instance, our helper simply closed and restarted Comodo, saw the issue was unchanged, and suggested we download and install the program again. Other queries were more successful, though, and on balance GeekBuddy remains a very effective way to get decent technical help, whenever you need it -- a major plus. Would you benefit from Comodo Internet Security Pro 2013? The program remains too complex for total PC beginners, we suspect. The average user will appreciate its largely automatic operation, though, while experts enjoy the powerful tools and extreme configurability. And if you’ll make even occasional use of GeekBuddy, in particular, then the current low price makes Comodo Internet Security Pro 2013 look like a very good deal. Comodo Internet Security Pro 2013 works on Windows XP SP2, Vista, 7, 8 (all 32 and 64-bit editions) and has an RRP of $49.99, but you can get it for the bargain price of $17.95 (saving 64 percent) from the Downloadcrew Software Store.